Explore less touristic spots off the beaten track where the normal excursion tours don't find their way so often. 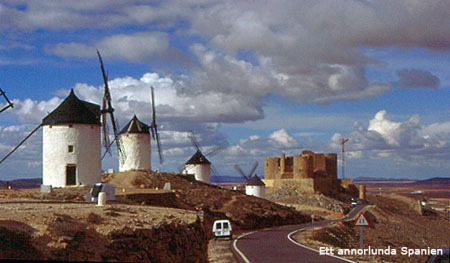 Why not try a legendary trip to La Mancha, about 125 miles south of Madrid, with Don Quijote as a companion? Some of the windmills in Campo de Criptana. According to an old legend in La Mancha, a young woman sold her soul to the devil and had a relationship with him. From this relation a baby-girl was born, and when she grow up she showed to be the devils offspring since she devoted herself to systematic environmental pollution. She burnt down all the forest and dried up the rivers. The only thing left in peace were the windmills, since the movements of the windmill-sails during nighttime reminded her of her fathers realm. The person who really immortalized the windmills in La Mancha is nevertheless the devils daughter, but the great author Cervantes with his story about the noble knight Don Quijote de la Mancha who fought against the windmills as if they were giants. In Campo de Criptana you will find the finest windmills in the region. There are still 10 of the 32 original windmills preserved, with names such as Burleta, Quimera, Garcilaso. Some of them can be visited, such as the oldest, Infanto, dating from the 16th century and preserved in its original state. Today, the open space in front of the entrance serve as a traditional meeting place for the Elders of the village. You will find them in chatting in small groups in the sunshine. Campo de Criptana has also preserved the old convent, El convento del Carmen and the church, La Iglesia de la Asunción. The small village consist of small white houses with built-in yards, narrow streets and lanes. We are in the middle of Don Quijote de la Mancha's chivalry route. All the villages in the region have connections to Cervantes. 11 miles from Campo de Criptana, is El Toboso with various palaces and mansions. In this village, Dulcinea (Don Quijotes fiancée) lived. Her house, which is described by the author, is situated in the outskirts of the village. There is an important Cervantes Library with translations from all over the world, among them a bizarre collection of dictator-signed copies, of Stalin, Hitler and Mussolini. The church in El Toboso is also described in the book and the monastery is so monumental that it's sometimes called the Escorial of la Mancha. The village is on of the few the French left in peace during the invasion, in popular parlance because they had read Don Quijote. Not far away is Quintanar de la Orden, from where Cervantes picked up other literally figures. The village has a huge tower, without proportion to the size of the village and a bullring dating from the 14th century. 5 miles away is an important railroad junction with the noble name Alcázar de San Juan. In this village you can find a number of churches; for example Santa María la Mayor, Santa Quiteria and San Francisco, the convent Santa Clara, the palace Gran Prior de los Hospitalarios and several bodegas from the 16th century. Close by there are some natural lakes, not very common for Spain; Las Yeguas, Los Pajaros, Los Carros etc. After visiting Alcázar de San Juan you can continue to Herencia famous for their good cheeses, there are a few interesting churches to visit also; La Merced and La Inmaculada Concepción. 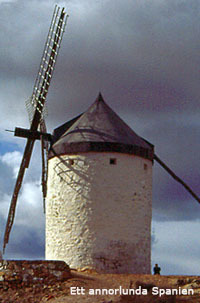 Maritornes is the name of the village windmill. Finally is Puerto Lápice worth mentioning. It is here Don Quijote was knighted. The village has a very well preserved old farm, today rebuilt as a restaurant, Venta de Don Quijote. "his" restaurant in Puerto Lápice.